Strapping Machines are packaging machines that use bands of flat steel or plastic tightened around a package or pallet of goods and fasten together to secure the package. Straps can bundle products together, improve containment strength and to secure a load to a shipping pallet. Straps are made from a variety of materials based on the required strength of the strap. 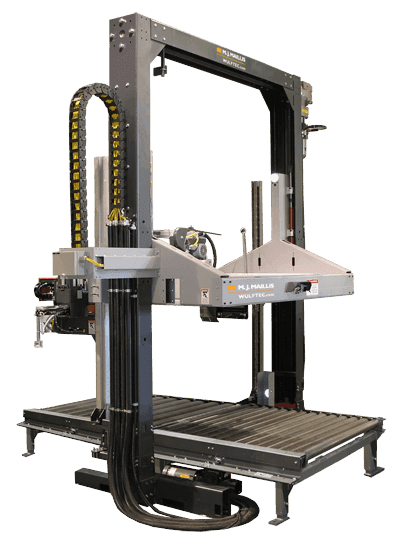 Fully automatic strapping machines that offer a drop off area or conveyor systems to position a load for strapping. When machine sensors detect the load, the straps are automatically applied, tightened and cut without the need of operator interaction. Strapping machines and straps secure products to each other, unitizing them for sale. This bundling method is commonly used for large products such as lumber or rolls of paper and steel. With strong strapping materials, these products hold together allowing for easier handling and transport. Strapping your products for shipment adds an element of extra containment to your packaging. Strapping provides added strength for packaging, improving the containment strength to ensure packaging continuity. This ensures your packaging remains intact and your product is properly protected from contamination during shipping. Strapping also provides an added source of containment for products that ship via pallet. Straps secure your products to the pallet, minimizing the risk of spillage or collapse. When used in conjunction with corner boards, straps also secure boxes to the pallet and add a uniform containment around the load. Strapping machines use advanced PLC controls to reduce the possibility of equipment malfunction. The high-quality aluminum frame maximizes durability and limits the risk of damages. Protecting your machine in an active packaging environment. Sensing devices use proximity switches to apply consistent pressure to your packaging without the risk of crushing.